Thawon Watthu Building was constructed by the initiation of King Rama V who considered the royal cremation ceremony requiring construction of an enormous temporary cremation hall was rather a waste. His idea was to build a permanent building which could be used to serve other functions after the cremation ceremony. Accordingly, in 1895, the occasion of 10,000 Days Anniversary of the King’s Accession to the Throne, King Rama V had H.R.H. PrinceKrommaphraya Narisaranuwattiwong designing Thaworawatthu Building and Phraya Samosonsapphakan (That Sirisamphan) was in charge of the construction. King Rama V presided over the Foundation Stone Laying Ceremony on 13th September 1896. Certain obstacles had delayed the construction until the King Rama V passed away. King Rama VI then had the work completed and assigned the building as the permanent location of Ho Phra Samut Wachirayan (Wachirayan Royal Library), officially opened by the King on 6th January 1916. In the reign of King Rama VII, the amount of books in the library has greatly increased. Therefore, the King had the library separated into 2 places, Wachirayan Library and Thawon Watthu Building. Wachirayan Library was moved to Siwamokkhaphiman Throne Hall in the Grand Palace to preserve religious scriptures, archives, and hand-written documents.Thawon Watthu Building was assigned for keeping books which belonged to King Rama VI, printed books and newspapers, and the library was renamed “Ho Phra Samut Vajiravudh” (Vajiravudh Royal Library). In 1933, the Royal Library Office was promoted to Department of Library under the Fine Arts Department and there were several changes after the reorganization until the construction of National Library at Wasukri Pier was completed. Hence all books from Wachirayan Library and Vajiravudh Royal Library were moved to the new building. In 1979, Fine Arts Department had some parts of the building renovated to function as Narathip Centre for Social Science Research in Commemoration of Prince Krommamuen Narathipphongpraphan, and also serve as an office of Architecture Division of the Fine Arts Department. The architecture of Thawon Watthu Building is a manifestly dignified brick masonry building with Khmer influenced style as seen in the gallery of Angkor Wat, adorned with elements such like 3 four-faced porticos and curved tiled roof. Thawon Watthu Building was registered as a NationalMonument on 30th June 1977. After Fine Arts Department has reorganized its offices, the Architecture Division and Narathip Centre were moved out from Thawon Watthu Building. 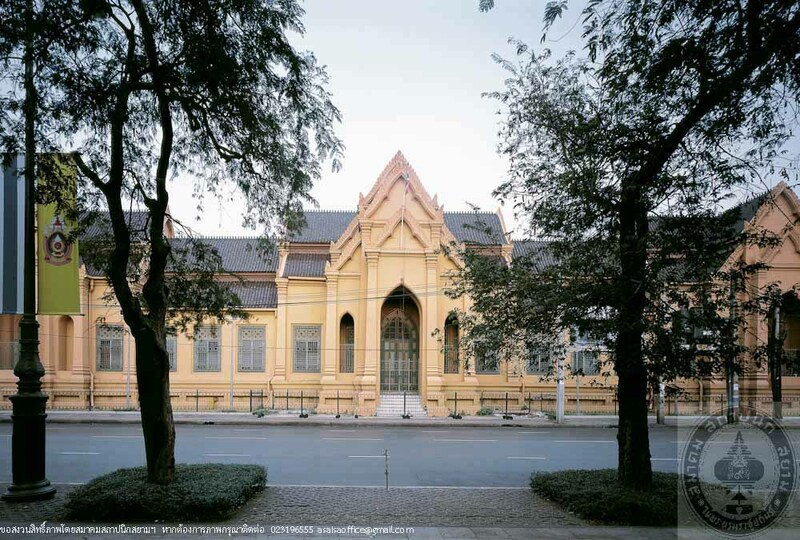 Subsequently, in 1997, the Fine Arts Department has renovated Thawon Watthu Building as King Chulalongkorn Memorial Exhibition Hall to commemorate the 100th Anniversary of King Rama V’s Royal Visit to Europe.